The Rotary Club of Auburn, AL recognized the 2015 Citizen of the Year at its weekly meeting on August 12, 2015 at the Saugahatchee Country Club. Dr. Mary Burkhart, former director of Olli at Auburn, was honored as the Citizen of the Year with a plaque and a charitable donation in her honor to Olli at Auburn. Dr. Burkhart was recognized for her long-time service to the Auburn community in many different aspects. She is still very active in many charitable organizations and shared with the club her love of working to better her community every day. 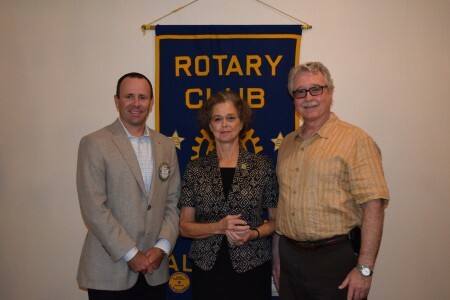 Pictured are Brad Wilson, Auburn Rotary Club President (left), Dr. Mary Burhkart (center) and Dr. Barry Burkhart (right).